Saunders Waterford is an exquisite watercolour paper, traditionally made on a cylinder mould machine. This is the superior quality watercolour paper made by St Cuthberts Mill and comes with the Royal Watercolour Society’s endorsement. Made using 100% cotton, the highest quality papermaking material, to high archival standards. Each sheet is buffered with calcium carbonate to help defend finished pieces of work from discolouration caused by acids present in atmospheric pollution. 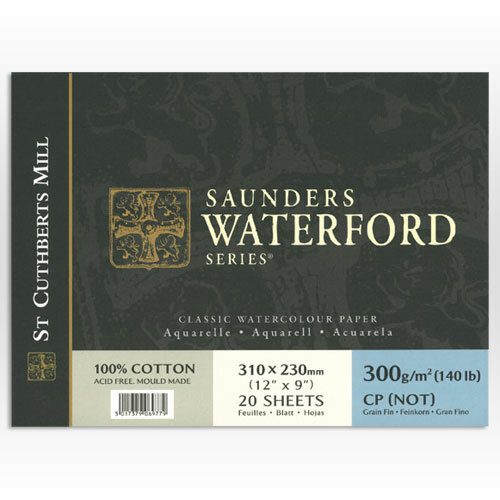 20 sheets of acid-free Saunders Waterford 140lb (300gsm) 100% rag watercolour paper gummed on all four sides. Ideal for the professional or amateur alike. NOW AVAILABLE IN 3 NEW SIZES! !